Call today to schedule an appointment with our plumbing contractors! Looking for professional plumbing repair for the Charleston, SC area? 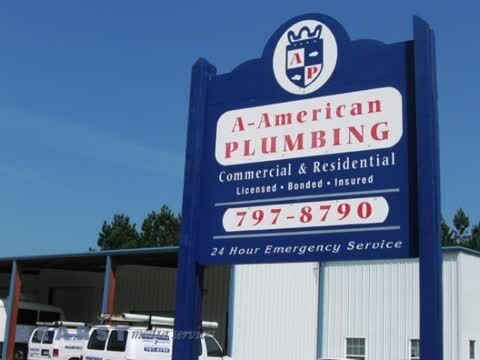 The plumbing contractors of A-American Plumbing provide complete 24 hour plumbing service and plumbing repair for commercial and residential clients in Charleston, SC and the surrounding areas! No one does plumbing repair better or faster than A-American Plumbing. Give us a call today to for more information or to schedule service. Ask About Our Electronic Leak Detection Service! Our plumbing contractors also offer water heater service. Our electronic leak detection service makes it simple to find your leak and fix the problem before it gets out of hand. But, as you well know, technology is only as useful as the person using it. We're proud to say that our plumbing contractors are some of the best around, constantly training to stay ahead of the curve. That's how we keep our work so affordable at such a high quality. It's also why we've earned the highest ranking the industry has to offer: Certified Master Plumber. If you have a plumbing emergency and you don't know who to call, call us, no matter what time of day it is. Our 24 hour plumbing service is always available for your emergency plumbing service needs! We also offer quality water heater service to keep your home comfortable. How do you know if you need electronic leak detection service? Look for sudden spikes in your water bills or unexplained mold growth. Both of these are signs that you have a leak somewhere in your home that you can’t see. If you spot these signs, call us for electronic leak detection service right away. We’re proud to help Charleston, SC homeowners get leaks under control so they can go back to enjoying their homes. As one of Charleston’s most experienced plumbing companies, the plumbing contractors at A-American Plumbing offer same-day plumbing service and competitively priced rates. For us, our experienced technicians make all the difference. We can handle any plumbing repair project that your home or business may be in need of, while providing dependable, quality results. No matter what time of day or night you are experiencing plumbing problems, we have you covered with 24 hour plumbing service! We Offer 24 Hour Plumbing Service! Our emergency plumbing service is plumbing repair when you need it most! Trust us when it comes to your plumbing repair. We pride ourselves on being some of the most responsive plumbing contractors in the area, and when we say that we offer 24 hour plumbing service, we mean it. That's because we know how quickly your plumbing problems and leaks can get out of hand. A few extra minutes here and there could be the difference between a minor inconvenience and a disaster. Our emergency plumbing service strives to make that difference. Water Heater Service & More! If you’re dealing with issues with your water heater and are experiencing no warm water to shower or wash your dishes, then it’s time to make the call. A-American Plumbing is here to return your water resources to your home or business. We provide the most reliable residential and commercial water heater service in the Charleston, SC area. When you call us, you learn that we are not only affordable, but very responsive. We will be at your home or business before you know it, diagnosing and fixing your problem with ease. Call and speak with one of our skilled plumbing contractors on water heater service today! We have the experience to handle all kinds of drain cleaning and snaking. We pride ourselves on our ability to safely detect and clean a drain while avoiding costly and unnecessary additional work as much as possible. However, for those unfortunate times when you need more extensive services, such as slab leak patches or slab leak repairs, we can provide those for you too, as discovered through our electronic leak detection service. Our plumbing contractors can do it all. Need someone to look at your sewer and drain lines? Not only can we offer quality sewer and drain cleaning, but we have the resources and experience to offer total repair and replacement in necessary. We'll utilize our video sewer pipe inspection tools to find the source of your problems with ease and get it taken care of faster than anyone else. Really, we're your re-piping specialist in Charleston, SC. We can replace all water lines, offering a total home pipe replacement service that no one else can beat. Need to have your bathroom remodeled? Not only can we replace your old fixtures with brand new ones, but we can even renovate your old piping and plumbing systems in the process. Of course, we offer all of the other services you've come to expect from our plumbing contractors. We can provide everything from comprehensive water heater service to shower pan removal and replacement and more. No matter what your plumbing repair needs are, give A-American Plumbing a call. A-American Plumbing is family owned and operated, with over 20 years of experience in the plumbing industry. We service Charleston, SC and the surrounding communities, specializing in clean, professional service for all your plumbing needs. Our company provides accurate estimates, same-day service and true 24 hours a day, 7 days a week emergency plumbing service. We are well experienced in all types of plumbing services for commercial and residential customers. As a company, we pride ourselves on providing excellent customer service that is second to none, taking care of your plumbing needs from start to finish. When you have questions or concerns about your residential or commercial plumbing service needs, please give us a call and we’ll be glad to help. A-American Plumbing is the plumbing contractor to call. When you have an emergency plumbing service concern, we will be able to respond to you much quicker than the rest, taking care of your problem before it escalates into something worse. A-American Plumbing offers all the plumbing repair you could ever need. Our plumbing contractors have extensive experience in everything from water heater service to total home pipe replacement. We can even perform slab leak repairs, utilizing advanced electronic leak detection to find the source of your issues. Call anytime: we offer 24 hour plumbing service!